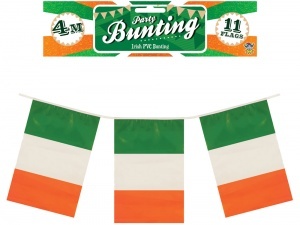 12ft length of Ireland national flag pvc bunting suitable for indoor or outdoor use. Ideal for Saint Patrick's Day decorations, Irish supporters events, International sports matches, etc. Green, white and orange pvc bunting with 11 flags per length. Each flag on this length of Irish flag garland is approx. 19.5cm x 29.9cm. Buy 6 lengths and save! Wholesale and bulk buy discounts may be available on this Ireland flag plastic bunting subject to your required quantity. Please call us to enquire.